One of my innumerable extra-curricular activities as a guitar teacher is to help, advise and generally keep an eye on what guitars my students buy during lessons with me. A big thing with kids of a certain age is picking a guitar because it looks good and buying it online without playing it. I should know, I’ve been there and got burnt! While some are happy to go with an open mind and play guitars until they find one that fits most people have tastes and preferences that make at least some decisions for them before they get into the shop! Necks on a guitar have a massive, massive impact on how the instrument plays. Making them match your style and hands is a huge part of buying a new guitar. Sometimes though you can pick up a guitar with a neck that feels good on first grab and then there is something not right when you actually go to play the thing. Frets are something people pay little attention to, but they can be the cause of the this neck disappointment. I find in actual fact that the size and shape of the frets has more of an effect on my comfort that the neck profile itself. So here, for your education is a quick list of the most common fret sizes and a brief note on each. 6230 – 0.112″ x 0.055″ (2.8mm x 1.4mm) – The biggest frets commonly available – as good as a scalloped feel. I find these to be a bit big for me! 6150 – 0.106″ x 0.036″ (2.7mm x 0.9mm) – The “medium jumbo”. Commonly found on Gibsons. Maybe slightly too large but my favourite in terms of those commonly found. 6105 – 0.08″ x 0.043″ (2mm x 1.1mm) – “Vintage fretwire” – often found on the older Fenders. 6100 – 0.103″ x 0.046″ (2.6mm x 1.2mm) – The true “jumbo” – approximately the same width as the 6130, but taller. 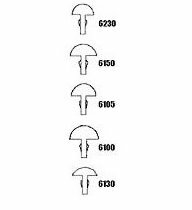 6130 – 0.096″ x 0.047″ (2.4mm x 1.2mm) – Tall and Narrow. One of the more popular fret sizes out there.